Inscriptions: u.l. handwritten in ink: "#17 / angel / bl [sic] + white - very fine screen / (as close to how the photo looks) / try to keep crack lines in background / words - keep outline of angel as / dark as possible"; l.l. handwritten in ink: "whole page / 17 1/2 / 17 1/2 / 23" shell"; l.l. handwritten in pencil: "#17 #18"
"Untitled." Corita Kent in the Grunwald Center Collection. 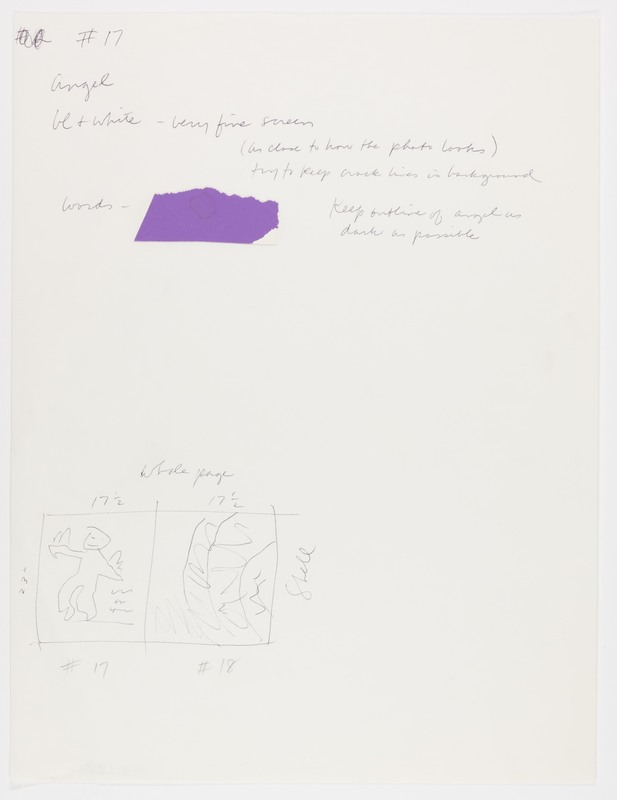 Los Angeles: Hammer Museum, 2017. https://​hammer.ucla.edu/​collections/​grunwald-center-collection/​corita-kent/​art/​untitled-layout-for-delft-angel-a/​.